Posted on July 21, 2013 by Michelle M.
Alfie is doing well. He’s still in quarantine. We visit him during the day and bring his cage out to the living room to watch tv with us at night. He tries to get as close to us as he can. If one of us leaves the room, he’ll flutter around his cage as if he wants to go with us. A little quirk of Alfie’s is that he will take one seed at a time out of his food dish and then hop to his perch to eat it. Last night he sat on my finger. Yay! I can’t wait for him to meet the rest of the flock : ). 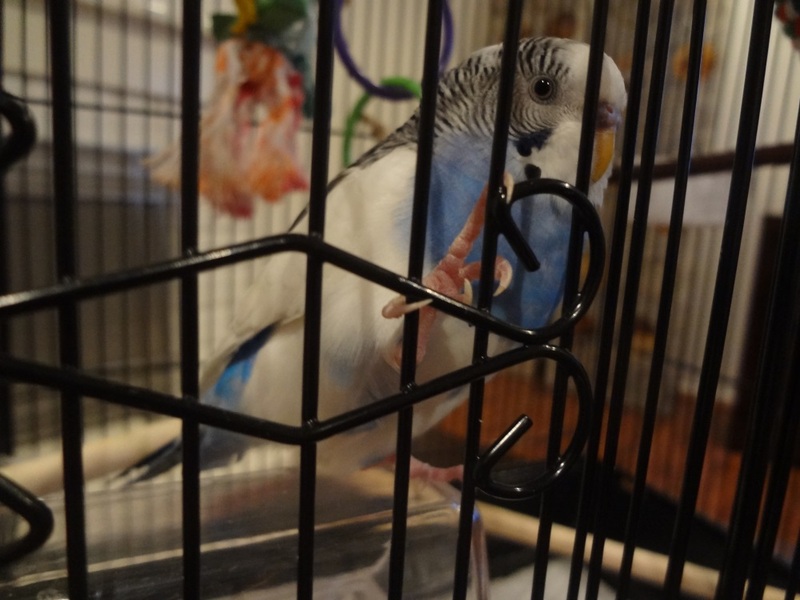 This entry was posted in Alfie and tagged Alfie, budgie, Cooper, parakeet by Michelle M.. Bookmark the permalink. Poor little guy, he looks like he’s in jail. Me too! He’s such a cutie. I hope they’ll all get along once he’s through with quarantine. He wants one of those scanners from Elysium.